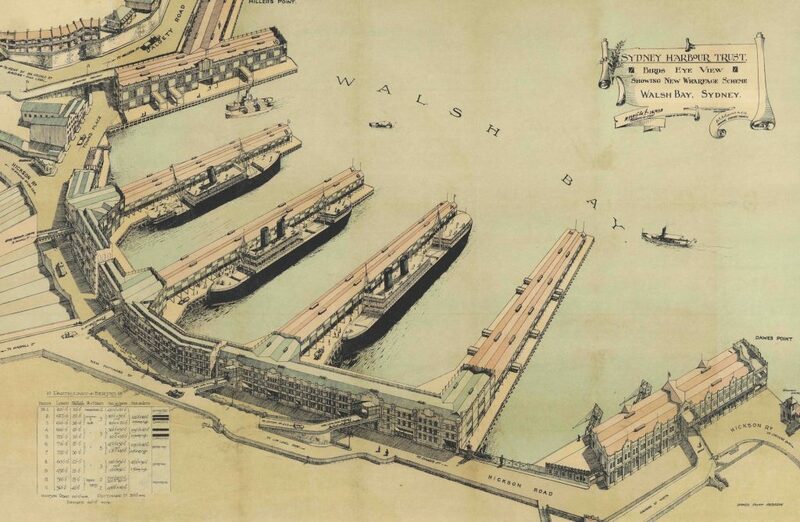 Our headland bay was never given a unique name on early maps of Sydney—but the label ‘Walsh Bay’ suddenly appeared on a 1918 aerial perspective illustration of the Sydney Harbour Trust’s local wharves development, then under construction. Printed copies of this poster were folded into the Trust’s annual report for 1919—suggesting that 2019 is the centenary of first naming of our waterway. Walsh Bay is named to honour the Trust’s engineer-in-chief, Dublin-born Henry Deane Walsh, who retired from the Trust in late 1919. Here is the text of an article about the Trust’s Walsh Bay rebuilding program, published in The Sydney Morning Herald on 17 November 1919. Transcribed by Janice Stutzman and supplied by Susan Rowe (both descendants of Walsh’s), this article can be accessed through the National Library of Australia’s Trove archive. GROWTH OF A GREAT PORT. WHEAT TERMINAL IN THE MAKING. Its tables strewn with maps and diagrams, rules and squares-the infinite paraphernalia of the draughtsman-there is a little hive of industry right at the top of the big building at the Circular Quay which serves as the offices of the Sydney Harbour Trust. The fifth harbour in the world takes a lot of keeping in repair. New works, too, are continually presenting themselves as matters of urgency—wharfs, access roads, stores, and so on, which must be erected in order to meet increasing requirements. So the little hive on the top of the Harbour Trust building is always a busy scene. With every inch of the intricate port set out on paper before them, its industrious workers never cease creating new mazes of curves and lines, and new masses of perplexing figures, which in course of time materialise into great wharfs, stores, or roadways, giving fresh facilities for the thousands of vessels which every year come Sydneywards from all quarters of the globe. When, after the bubonic plague, the Harbour Trust came into being, in 1900, it was confronted with a mammoth undertaking. The object of resuming the whole of the waterfront required for shipping purposes, together with the wharfs, stores, etc., standing there-on, was to clean up the harbour, and replace rat-ridden and rotten constructions with a modern port-equipment, suitable for the clean and rapid discharge or loading of the big steamers which were coming in increasing numbers. It was a work of years, and it is yet far from completion. But anyone who had not seen the great mercantile section of the harbour for a few years—that part comprising Miller’s Point, Darling Harbour, Johnstone’s Bay, and around Glebe Island—would, by taking a run round in a launch, soon realise that the progress of a wonderful metamorphosis was well advanced. There are parts which he simply would not recognise. First of all, as he turned Dawes Point and headed towards Miller’s Point, he would look for the familiar old-time structures of Parbury’s and Dalton’s wharfs, which, with their dark and devious ways and their irregular clusters of gloomy and forbidding-looking store-houses, might have served as a congenial retreat for Mr. Quilp [Charles Dickens’ nefarious villain in The Old Curiosity Shop]. Instead, he would be just in time to see in course of completion a battery of fine jetties, providing 11 berths, fit for anything afloat, and equipped with lofty and spacious double decked buildings, in which the utilitarian has not been divorced from the picturesque. The new wharfs are 130ft in width, and extend to an average length of 660ft, and the little bay which they occupy has been named Walsh’s Bay, after Mr. H. D. Walsh, one of the commissioners, and the engineer-in-chief, who retired a month or two ago. It is interesting to watch the work that is going on here – the gaunt skeletons of the high, buildings that are creeping along the two still-uncompleted jetties, and the difficult process of planting the enormous piles which the depth of the water necessitates. They are, indeed, the largest piles in the harbour—145ft to be exact—and each is composed of two ordinary piles securely spliced together. The water is about 50ft deep, and there is then about 100ft of silt before the rock bottom is reached. Running along the rear of the jetties, with which it connects, is a handsome block of stores built of brick and stone, and fronting the new main port road—Hickson-road as it is called, after an ex-president of the Harbour Trust. This commodious thoroughfare, 100ft in width, which the commissioners propose eventually to carry right round the Darling Harbour foreshore to Pyrmont, is still awaiting the removal of the Kent-street works of the Australian Gaslight Company before it can proceed beyond that point, which it reached some time ago. To prevent the traffic from Walsh’s Bay having to traverse the length of Hickson-road and other thoroughfares in order to reach warehouses situated in the closely populated but steeply elevated areas immediately behind, a massive concrete roadway—Pottinger-road—is being constructed, commencing directly opposite the Walsh’s Bay stores, and rising by a fairly easy grade to Windmill-street. For some time this work had to be suspended owing to shortage of money, but it has recently been recommenced, and it is expected that it will be completed early next year. It is being supported on strong, concrete pillars, and the space left underneath it is being enclosed and made into bond stores. From three points in this elevated roadway it is intended to place wide concrete bridges across Hickson-road to the upper floor of the store-building, thus greatly simplifying the carting away of merchandise. In rounding Miller’s Point to cut across the mouth of Darling Harbour to Jones Bay, after having completed his inspection of the interesting developments at Walsh’s Bay, the visitor would notice the newly completed extension to Dalgety’s Wharf, which has absorbed the old Messageries Maritimes Wharf. And up Darling Harbour, as far as the gas-works, he would be struck by the brightly painted double-decked buildings of the jetties which have sprung up during the past few years. At Jones’s Bay, besides a magnificent concrete wharf—completed last year, and now occupied by the Darling Island Stevedoring Company—he would see the Harbour Trust’s submarine rock-cutting plant at work, completing its task of making the berths 35ft in depth. This is the depth which the trust aims for all its new wharfs. Here is one of the finest structures of its kind in the world, and it alone is worth anybody’s while visiting, as a splendid example of the solidity, spaciousness, and convenience of a great modern landing-place. And a year or two ago it was the site of but a few straggling workshops, and rodents swarmed where now they find no refuge at all. It is 260ft in width and 1150ft in length, providing three berths. A whole hill-side has been bitten off to give adequate road and railway access to it, and to the neighbouring triangular wharf, recently built of timber, 600ft long, and providing two berths, which is occupied by the Osaka Shosen Kaisha line. The Sydney Theatre Company’s February 2019 post on the centenary of naming Walsh Bay is here.